"It's obviously a female thing, I came home late the other night and the wife cut the feet off my favourite socks too." "You shouldn't blow your own trumpet." "No. You go for the coffee… I've only got one leg"
"You should be ashamed, mate. You are dishonouring Socktoberfest." "Duzz vun know Stairvay to Heyvan?" "Don't you think you should do something about those varicose veins?" "How much for the musical typewriter?" Bye Ern I’m off, our relationship never got better it only got wurst. "So you think you've had a few beers? 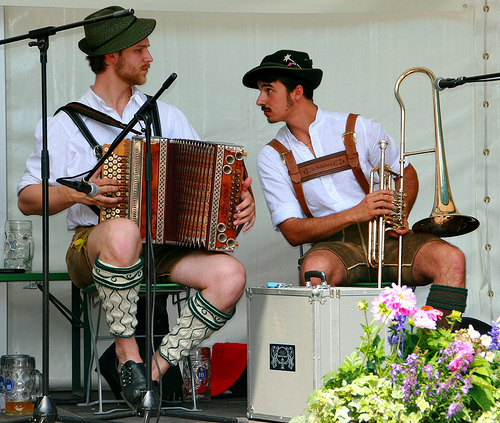 Start drinking in Earl's Court, end up in Munich, wearing lederhosen, playing a trombone. Now that's a few beers mate." they want us to do a justin bieber song. Funny? No, you don't look like you're dressed funny. "Where you get your legs waxed?" "Can you shift your box off my foot mate?" Where did he say I had to stick it? "Let me be your squeeze box." "My boyfriend is not a slapper!" "Aren't you supposed to wear them with the bells on the outside?" "Psst ... Du. Du hast. Du hast mich."
"You'll be wearing this if I hear that Allo, Allo theme tune again." "Lucas I told you we needed a singer. We've been busking all day and still don't have a tenor"
"Pull the other one. It's got bells on." "Do you enjoy playing the accordian, and do you make a decent living from it?" "To be honest, am finding it to be a bit of a squeeze at the moment." "You said it was a landscaping job!" "Don't blame me. I thought the man said he wanted us to lay the hosin' in the garden."